I’m jumping forward just slightly over Portofino, which I’ll be sharing next. If you followed our path on Instagram or Snapchat, you’ll know that we went from Lake Garda to Portofino. While we were in Portofino, we had plans to take a day trip to Cinque Terre, but the weather didn’t really allow us to do so. Instead, we made a detour after we left Portofino on our way to Tuscany. Since we didn’t have the whole day to explore, we picked two of the towns in Cinque Terre to visit and ones that were easily accessible to each other, Manarola (on the right below) and Riomaggiore (on the left below). If you’ve been to Cinque Terre or have looked up the geography, you’ll know that it’s a set of five seaside towns along the Italian Riviera. There are a few ways to get between the towns depending on how much time you have- there are hikes, ferries, trains and you can also drive and park outside of the towns. 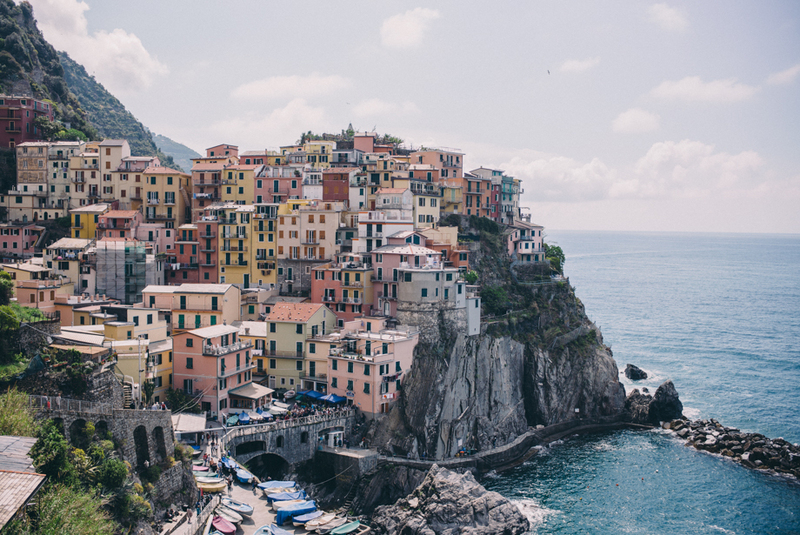 We chose Manarola and Riomaggiore because they’re right next to each other and it was easy for us to get out and get back on track to Tuscany. We drove to Manarola, parked just outside (you cannot drive in any of the towns) and walked the short distance into town. It’s definitely not as bad as everybody says, but definitely get there early because by 10am, the parking was completely full. In Manarola (above), we followed the path that led us up to a great vantage point, looking out over the colorful town. It was the scene I was envisioning in my head, straight out of a postcard (or Pinterest!). Even though we were technically there in low season, it was packed! Like body to body lining up to get pictures packed. I can now see why the Italian government has plans to limit the number of tourists allowed to visit Cinque Terre per year (1.5 million a year vs. the 2.5 currently, 1/5 of that is from cruise ships alone). In the future, they’re saying that you’ll have to buy tickets online or they’ll have an app that will say which cities are closed. It’s unfortunate, but just being there, I can see why. It takes away a bit of the experience when you can barely move through the tiny towns. With that being said, it was definitely worth the trip and I would have been so sad to miss it! To get to Riomaggiore, we took the train, which was the quickest and easiest experience. We would have loved to hike the path between the two, but unfortunately it was closed while we were there (and we also didn’t bring proper shoes, ha!). But the train worked out perfectly for our limited time we had to spend in the two cities. If you take the path on the left side of the town looking out at the water and follow it, you’ll come down to a spot of rocks where you have a great view looking into the harbour and the rainbow of buildings that make up Riomaggiore. When I saw this Lovers + Friends dress, I immediately thought “Italian Riviera”. Anything blue and white stripes is almost an immediate yes! The day started off a little bit chilly, so I initially had on this light pink sweater over it, but by the time we made our way through packs of tourists and walked up to the good vantage points, the sun came out and I was warm enough in the dress alone. The other two got a table for lunch while Thomas and I kept exploring. We stumbled across a focaccia place in Riomaggiore called Panificio Rosi that was incredible! We bought enough for the two of us to snack on all day but we ended up eating it all right then and there. Definitely add this spot to your list if you’re looking for lunch or just a quick bite to share. Our favorite was the one layered in olive oil, pesto, mozzarella, tomatoes and olives. That dress is so perfect for all the nautical scenery! What a gorgeous trip! I haven’t ever heard of these little gems! I am so glad you shared! It looks like a spot that is too beautiful and unique to miss! I love the dress, too! You look gorgeous! What a fab vacay dress! This area has been on my wishlist for a long time! It looks stunning! You dress is the perfect little number for the scenery! So envious of this trip! Glad the weather worked out for your Italian adventures! When I went there last year in March, it was so peaceful and quiet and beautiful. I’ve heard it has gotten a lot worse this past year with tourism. Hopefully they cancel the cruise trips there to help preserve the lands. Super great photos, so enchanting, inspiring and absolutely breathtaking! Wanna go there immediately! You two girls looks so adorable. Cinque Terre is on my list!! Gorgeous photos! These photos don’t even look real, they are so beautiful! Looks like you had an amazing time! Wonderful place! I have it in my “to visit list”. You chose a lovely dress for this visit…perfect for the photo shoting by the way. Gorgeous photos! I can just imagine how packed it would be in high season! You and Rose look like you have so much fun together. Love your friendship! I’m obsessed with that dress! So cute. Gorgeous, love how you styled this look! I was just there last year and we hit it on a lovely day. Busy, but not too packed. I’m glad they will be limiting it because too many people ruin the serentity of the views! Cute dress and brilliant photos. I experienced the same in Tuscany with having to get to the various towns before they were too crowded. You definitely need to be one step ahead if there is anything in particular that you want to see or capture in photos! This looks so fun! You and Rosie look like you are having so much fun! I really love these photos! I want to visit Cinque Terre so much! These are beautiful photos. This is one of my dream destinations. what a perfect dress! I love the stripes the colors of the city and just about everything! This looks amazing! Love your whole outfit! Absolutely love that dress! Too cute! I love the nautical feel of the dress! It’s perfect for spring and summer. Check out my post about YSL Beauty tapping Zoë Kravitz as their new brand ambassador and the intentions behind this move. I’m in love with every single dress you wore in Italy but this is by far my favorite! I love this scenery, never been to Cinque Terre before, but I guess I definitely have to! Such a cute dress! Y’all lo too cute together exploring. Beautiful city! Cute dresses you two. Looks like a beautiful place. I’d love to take pictures there but body to body crowds are not for me lmao. I like my space. Gorgeous photos and love your outfit! Julia–the perfect dress for this spot! Can you share what size you’re wearing? Thia just hit the top of my summer dress “must” list! LOVE this dress!!! So super pretty with the scenery!! LOVED Cinque Terre! the hike is so gorgeous! stunning photos as always Julia!!! Cinque Terra is stunning! So beautiful with all the coloured buildings & sea port. Plus I love both of your dresses – I honestly couldn’t pick a favourite! I’m in love with every single dress you’ve worn so far on your trip! Great outfits and photography as usual! Wow! These photos are just gorgeous! All of the pictures look like my Pinterest travel board! Lol :) This looks like such a fun trip, and I’m obsessed with that dress you’re wearing too! I love the length and how the top ties. Such a cute piece for summer! Absolutely stunning – the photos tell an amazing story of your travels and style! Thanks for so much inspiration! What a cute striped summer dress, I must have! I honestly don’t know what’s more beautiful… the scenery, your outfit or you and Rosie. Perfection! So pretty! !I can’t believe tourism is so overwhelming there. I mean I can, but wow, the numbers are so large! This is such a lovely dress and location. I would love to visit Italy sometime soon. Your posts make me feel like I’m in Italy as well! Hey! I’m going here in August. Any specific suggestions of places to go or restaurants? Cinque Terre is such a beautiful part of Italy. Such lovely pictures, Julia. The scenery and everything is just Sooo! Thank you for the insider scoop Julia! After reading your and Rosie’s posts about Cinque Terre and Portofino I think I may (sadly) have to skip Cinque Terre. The major crowds and uber-touristy nature of it might ruin the relaxed vacation feel altogether. It’s good to know about Portofino though, so I will put it on my travel list! Love the dress! It’s perfect for Italy! Cute hat & love the dress! Dream trip right there!! Love both your dresses! These pictures are breath taking and your dress is beautiful! Every single shot is like a postcard! 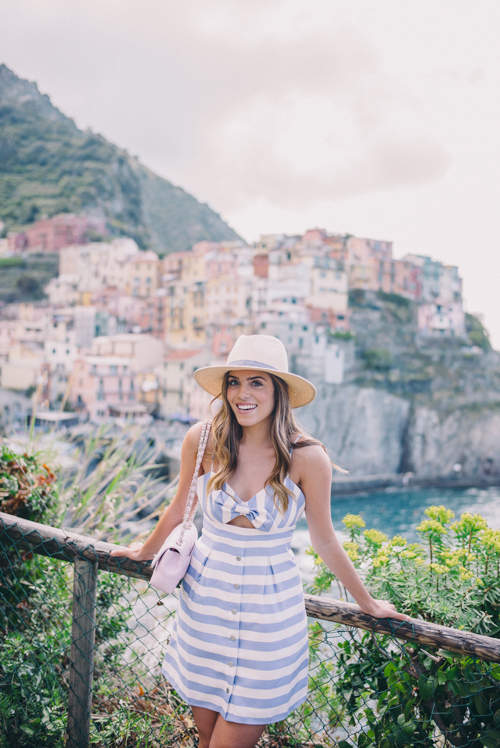 And you’re totally right – this dress is perfect for the Italian Riviera!